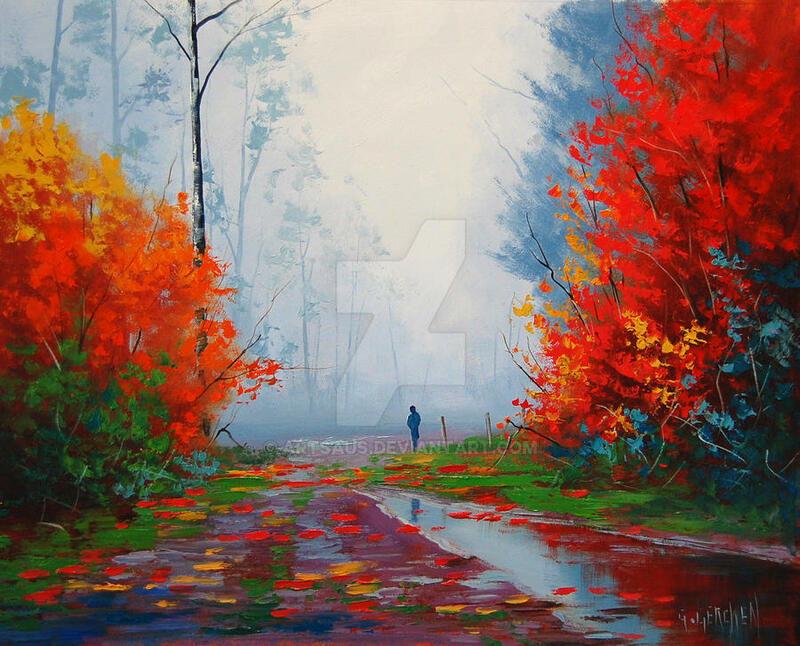 Absolutely gorgeous use of colors, and I love the shapes of the trees and the reflection. Wonderful - worth a DD!!! What an interesting composition...your use of layers is quite evident in the leaves and water, especially with the way the sky mutes into blue with the objects further in the distance. It truly adds depth. Even more impressive is the fact that these sharp colors and soft hues can coexist in this picture without being flagrant. The addition of solid, definite objects in this picture illustrates my point even further because it keeps the colors from looking like one giant blob. The size and lack of detail of the person in the distance strikes me the most, however; I feel as if Nature herself is the true star here--not that she doesn't have the right to be. It really reminds me of Transcendentalism. Now about the water--how do you do that with paint, particularly with the reflected objects? I really feel like I'm looking at real water here. This painting is so vivid. I love the soft misty background and the fiery autumn colors in the foreground. Excellent painting!!! Beautiful paimtimg with perfect composition. Beautiful colors! Congrats on your well deserved DD! Wow, awesome work. Really beautifull..
Bravo! Such a lovely painting! The vibrancy made me wonder if it was a digital image for a minute. This is absolutely stunning! Awesome! Saw it spotlighted on Facebook! my medium is acrylic ,since it's easier for me to mix and use water with them, do you think this picture can be painted with acrylics? AMAZING! GZ on well-deserved DD! I am super duper baked right now, so I'm sort of hyper focussed on this. I have to say that this is an absolutely astonishing painting, both bold and stylistic, believable, with depth. Bravo!! I am filled with wonder, looking at all the beautiful colors at play, creating a wonderful creation. I look at this and I just want to get closer and closer in. It draws you! Eye- catching.Happily, I stumbled upon this!Great. These are my favorite kinds of days. I LOVE the colors here! This is gorgeous. I love your use of colours and visual space. If I could afford to, I would totally purchase this for my home. The vibrancy takes what might be a bit depressing scene and gives it an air of hope, or maybe it's just peace. Either way, it's a really beautiful piece of work. please will you teach me to paint artsaus lol great job! Wow! Stunning work! I love the contrasting colors!! Gorgeous use of color here! Makes me wish I was in New England, where the leaves actually turn these shades! Fabulous work! woah woah beautiful colours! <3 well deserved DD! Geee, this is so beautiful. What a great talent you are.